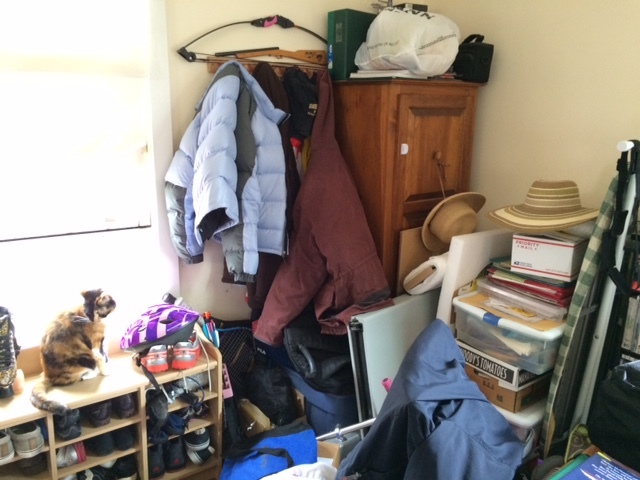 As we head into Spring, I thought I would have more interest and enthusiasm for decluttering. You know, spring cleaning and everything. However, I am still struggling with some lingering winter malaise. Yesterday, for example, rather than decluttering or going for a run, I took a nap. 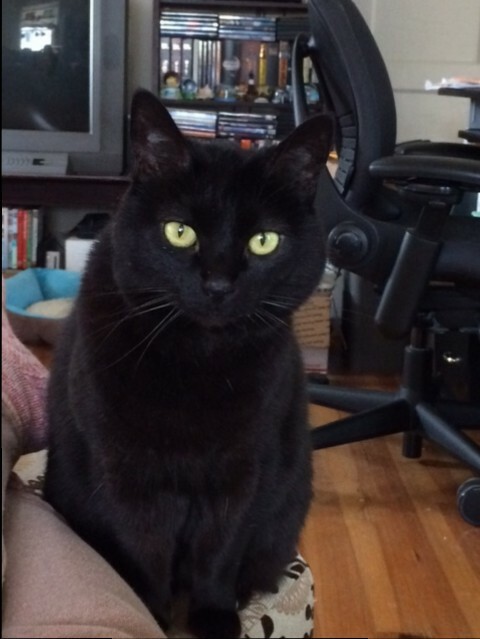 My kitty Fifi joined me, and it was a very nice nap. Today, I intend to get a few things done though. I have several items ready to put on eBay, I am going for a run later, I want to finish assembling the top of the second quilt that I made for my parents (they were supposed to be for Christmas but I have decided since they are so late that they will be a Mother’s Day / Father’s Day gift instead), and I am going to be helping my daughter finish up her Spanish. But I also want to get started on my next decluttering project: The Corner Between the Shoe Rack and the Blanket Chest in the Dining Room. The tall chest in the center of the picture is a blanket chest. The area to the left of that is the area on which I will be focusing. You may be thinking, “Wow! That is a pretty small area. What are you, super-lazy?” Well, one of the boxes stacked there contains papers – records, documents, etc. Going through paper clutter takes much longer than regular clutter. A single, banker’s box of papers can have literally thousands of papers in it. Most of them can be recycled or shredded, but some need to be saved. And for that reason, you must look at every one of them. It’s a slow, tedious process, and you can not let it bog you down. The first thing that I did was assess the area to determine what kinds of items are currently living there. Then, I created a mind-map. Quiz time! Did you find the theme? 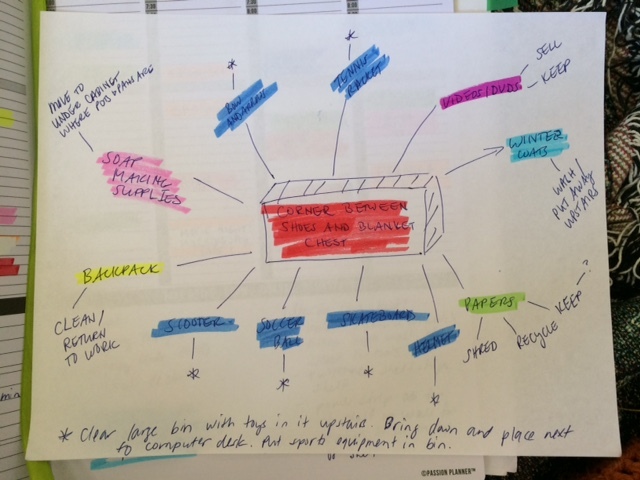 It was not until I mind-mapped the area that I saw the theme – sports equipment! Most of the items in the area are sports equipment, mostly belonging to my daughter. These are items that will hopefully go into the the closet under the stairs, once we remodel it. However, in the meantime, I had a great idea. When I was doing some decluttering in our spare bedroom last fall, I came across a large Rubbermaid container the size of a trunk. It was about 1/3 full of baby toys. I had run out of decluttering time and energy, so I just left it there. It is still sitting in the middle of the floor where I can trip over it every time I go in there to practice my bass. So my idea is this: I take the toys out of that container and put them into one of the many smaller empty containers. Then, I can bring the large container downstairs and use it to store all the sports equipment. The only problem is that it does not fit into the current space. So I decided that the container of sports equipment can live in the living room next to the computer desk until the closet is ready. Of course, there are already things in that spot, including the shredder, boxes of stuff that I am putting on eBay, a box of stuff waiting to be shredded, etc. And now you know why I haven’t started this project yet. I always say that our house is like one of those puzzles where you have to slide the pieces into the empty spot in order to move the other pieces. Because in addition to making room for the sports equipment, I need to make room in the kitchen for the soap making supplies. They will go in one of the lower cabinets with our pots and pans. The cabinet is only half full because the space is so poorly defined (pull-out shelves are planned for the future! ), but it will be fine for a box of soap supplies that I only use once every two or three weeks. So in order to make this project work, I have to move things around in four different areas of the house: the third bedroom, the living room, the dining room, and the kitchen. Whew! The backpack goes with my work laptop, but weighs a ton by itself, so I will just return it to work. We will go through the videos and DVDs and see if there are any we can get rid (there is another box upstairs, so we will try to consolidate the two). I will wash the winter coats and put them away upstairs (I actually wore my winter coat yesterday to my daughter’s soccer game because it was so cold!). And then there’s the papers (sigh). I plan to break this tiny area out into two or three days. Today (hopefully) I can corral the sports equipment. We can go through the videos and DVDs one evening this week, and I can go through the papers a little each night. A couple of years ago dealing with the work required to declutter this tiny area would have made me throw up my hands and give up. But now, by using mind-mapping to break the clutter into categories, and then defining a plan for each category, I am better able to get my head around what needs to done. Hopefully, by next weekend, I will have the reveal for you!